Hosted by ADCI and GoM Diving Safety Workgroup This past February at Underwater Intervention, the Association of Diving Contractors International and the U.S. Gulf of Mexico Diving Safety Workgroup hosted a symposium covering the expanded presence of lionfish in the Gulf of Mexico and the dangers they can pose to commercial divers. The symposium was well attended, with roughly 200 industry stakeholders from the commercial diving, oil and gas and other industries sitting in to learn how to mitigate these dangers and better protect personnel involved in underwater operations. 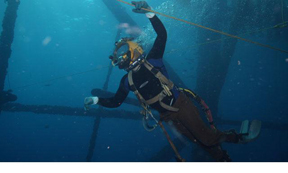 We begin our seven part series on client education with a conversation on the role of leadership and its part in mitigating risk for both the diving contractor and the client. This episode breaks down the steps that must be taken before conducting underwater operations. Job planning and Job Hazard Analyses are invaluable tools when assessing and mitigating risk and ensuring adherence to industry practices and regulations. ADCI contractors are committed to best industry practice, quality of work and the safety of their personnel over profit. This commitment reduces the risk of incident, injury and liability to a project's stakeholders. Pre-planned preventative maintenance programs work to ensure the safety of personnel and assist in mitigating costs associated with equipment failure. This episode reinforces the importance of such programs and discusses the benefits associated with them. Underwater burning creates hydrogen / oxygen mixtures that are highly explosive. Consider the tips outlined in this updated video before performing underwater burning.